After acquisition by Sophos, HitmanPro.Alert was released as a separate product and Malwarebytes have introduced their major new version Malwarebytes 3.0 by integrating many small tools into one. Both are Paid software but after free trial if you do not upgrade they still provide some features for free. Lets have compare features of these software as free version and premium version. Both software have their own detection technology, So choosing the best one is depends on your priorities. HitmanPro.Alert can also handle the situation when system is in no boot situation. HitmaPro.Kickstart can work in this case. After the launch of the Windows 10 now kickstart is not available. Malwarebytes and HitmanPro are one of the most popular and effective Anti-malware program. We are discussing some of the features and difference of technology between these two. To run a scan malwarebytes must be installed in Windows. Though it takes little time in installation but some times infected virus denied to install the program. In this case HitmanPro can scan just by running its portable scanner. Later on you can also install HitmanPro.Alert to activate the realtime scanning functionality. HitmanPro.Alert required internet connection to perform the scan whereas Malwarebytes can scan without internet connection. Malwarebytes only require internet to download its latest threats definition file. HitmanPro uses cloud based Multiple Antivirus engines to scan a suspicious file. If it found some suspicious file it upload that file to the cloud to scan with multiple antiviruses like Bitdefender, Avira,Emsisoft, Avira etc. Whereas on other hand Malwarebytes perform scan based on their offline malware database. Both used different method for real time protection. Malwarebytes uses its signature database to identify the threat on the other hand HitmanPro.Alert uses behavioral detection or signature less technology for real time protection. Both Malwarebytes 3.0 and HitmanPro.Alert have the Anti-ransomware protection in their paid version to safeguard data from cryptoware. What will happen after free trial? After free trial of both the software you can still use some of their features available as a Free software. And you can upgrade to premium version any time to utilize all the features of the software. Above comparison table can give you the idea of the features of both the software as premium and as free. Can I Replace my Antivirus Software with it? 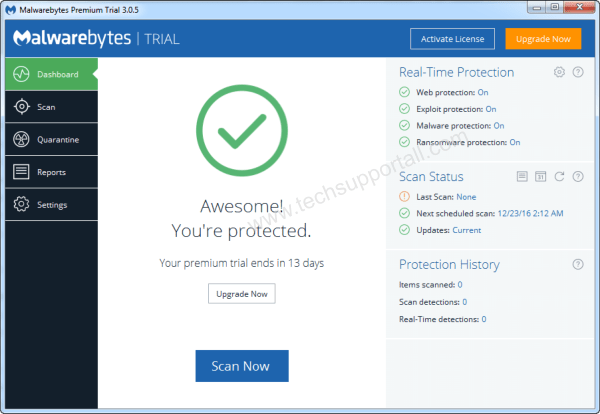 Malwarebytes claims to replace your antivirus software. But HitmanPro is still telling itself as second opinion scanner. 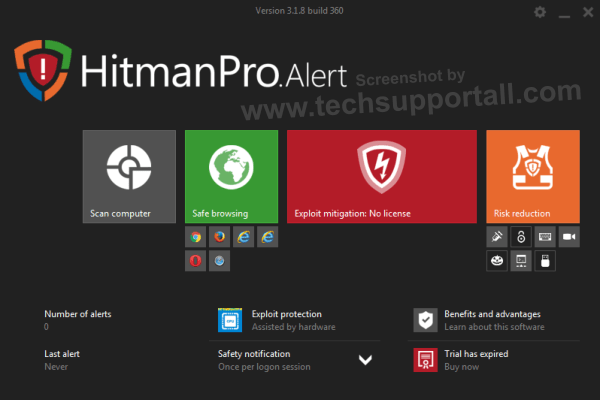 Though HitmanPro.Alert is more than just a second opinion scanner and can be used as a replacement of antivirus. Another point to be noted here is that Antivirus and Internet Security is different program, So if security is your serious concern then do not replace your internet security suite and keep these Anti-malware software as an extra layer of security. But users who uses basic antivirus software, They can replace their antivirus with Anti-malware software. Can I use these with my existing Antivirus / Internet Security Software? Yes both these software are compatible with mostly all reputed security software. For enhanced security you must have add this extra layer along with your existing security software. Both these software are equally light and takes very less system resources. Which software will I Choose Malwarebytes 3.0 or HitmanPro.Alert? Both software works almost equally good. But here is my personal review about both these software. Hopefully it will help you to choose the one which fits to your requirement. HitmanPro is better in cleaning an already infected system and Malwarebytes is better in protection. HitmanPro.Alert is better in cryptoguard and ransomware protection whereas Malwarebytes is better in exploit protection. Malwarebytes have Malicious website protection which blocks you to visit to bad website whereas HitmanPro.Alert encrypts all your keyboard inputs like username and passwords on internet to make it hard to read by a hacker. HitmanPro provides some of the extra features like Webcam notification, It notify you when any app uses your webcam. And bad USB Protection, Process protection from hijacking. Please let me know if anyone found any false information in this article using the below comment box. Please also share your views and experience of using these software. Wonderful comparison. It can help a lot for the confused people to decide. But still I am confused if I go with malwarebytes then my separate antivirus expense can be saved. But I like the feature of hitman pro like keyword encryption and webcam protection etc. This is essential for me. Can I go with hitman pro without any other antivirus. People please share your experience. Both the antimalware software are great and it is really hard to declare any one as the winner. Yes you have to find out your preference and need to decide. Major difference between these antimalware and inetrnet security suites is the firewall and traditional virus definitions. But yes these can be a replacement of basic antivirus. So if you are using an internet security then you can choose the hitmanpro for keyword encryption and webcam security. Can you just get both? Use both as licensed programs. Malwarebytes replaces anti virus and The Hitman as a backup for it. That is all I use, Defender is turned off. One point make sure to deactivate license for Malwarebytes before performing a system or system image. Not necessary for the Hitman. This is simple protection for my 4 dell pcs. If you do want Complete security than by all means stay with an anti-virus suite for more comprehensive protection. EXCELLENT ARTICLE! Can I load the paid version of these two on other computers in my house? If yes how many? For what it’s worth I’ve had an issue with my computer for a while with the “update Adobe Flashplayer” bug. –PC**** could find it well enough so as to block it (without telling me where/what it was? ), but would be frequent Chrome crashes rather than the PopUp window. — Malwarebytes itself did not find it, nor did Zemana AV, but the Malwarebytes specialist AdwCleaner did find it as DRVAGNT.sys. And it tried, but could not remove it. –HitmanPro found that bug and actually was able to remove it! Chrome screens are twice as fast now! Haven’t crashed in the few days since!